BURBANK, CA--(Marketwire - March 4, 2011) - After over 4 million records sold and numerous awards across music and film over the past decade, three-time Grammy Award winning singer/actress Jill Scott is proud to announce that she has entered into a distribution deal with Warner Bros. Records. The unique relationship with the iconic label bolsters the Jill Scott brand into the next phase of her successful career. Jill's eagerly awaited fourth studio album, The Light Of The Sun, will be released later this year. "I've always looked to empower my fans through my message of love, independence and strength," comments Jill. "A lot has gone on in my life since my last album, so I'm extremely excited to share the new music with all of the people that have supported me these past ten plus years. This album is very revealing, and I can't wait for everyone to hear it." "As the music industry evolves, the relationship between artist, management and label is constantly changing," comments Shawn Gee of Sports & Entertainment Financial Group, Jill's business partner. "Foregoing the traditional formula and strategically creating a true partnership amongst us all, I have to commend Warner Bros. for recognizing Jill's worldwide brand and acting on it." Warner Bros. Records CEO Todd Moscowitz reveals, "Jill Scott is a masterful performer with a proven artistry across film, TV and music. We are thrilled at the prospects with this partnership and eager to steward the next phase of this uber-talented artist's career." Currently in the studio putting the final touches on The Light Of The Sun, a sneak preview was most recently given to the hundreds of thousands that packed her widely successful 20-city national arena tour with Grammy Award winning singer Maxwell. The powerful duo sold out full arenas throughout the country, including New York City's legendary Madison Square Garden and Los Angeles's Staples Center. Fans can expect to hear even more off the new album when Jill headlines the upcoming Essence Music Festival alongside Kanye West and Mary J. Blige, July 4th weekend. Three-time Grammy Award winning singer-songwriter, New York Times Best-selling poet, and critically acclaimed actress are only a few titles held by Jill Scott. Before being named People Magazine's Top TV Breakout Star of 2010 and appearing on VH1 Divas alongside Aretha Franklin, the triple threat began her career collaborating with musical icons, The Roots, Will Smith, and Common in the late 90s. 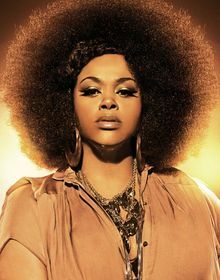 In 2000, she released her much anticipated debut record, Who is Jill Scott? Words & Sounds, Vol. 1, a double platinum album that earned Scott several Grammy nominations, including Best New Artist. Two more critically acclaimed albums followed, Beautifully Human: Words & Sounds, Vol. 2 and The Real Thing: Words & Sounds, Vol. 3 which garnered two more Grammy Awards and spawned multiple worldwide tours. Not just limited to music, Jill Scott is a true multimedia brand across books, clothing, TV and film. Most recently, Jill was cast as the lead character in the HBO/BBC mini series filmed on location in Botswana, The No. 1 Ladies Detective Agency, a Peadbody Award winning show directed by the late Oscar Award winning director Anthony Minghella. Before that, Jill starred alongside Tyler Perry & Janet Jackson in the #1 national movie series Why Did I Get Married? as well as Lifetime Movie Network's Sins of the Mother, the made for TV movie which became the second -most watched premiere in the network's history. A consummate writer at heart, she penned The Moments, The Minutes, The Hours, a compilation of poems that instantly became a New York Times bestseller. Scott also developed an intimates line for Ashley Stewart and founded Blues Babe, a registered 501(c)3 foundation which supports minority students pursuing college degrees.